£20,000 per minute is how much a car manufacturing company like Nissan would loose if the production line had to stop because of even the simplest of fault. 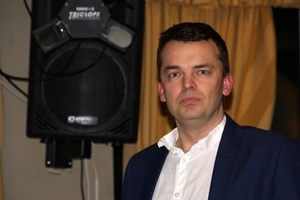 Our speaker Craig Smith talked about Total Productive Maintenance (TPM) which is the oversight dedicated to ensuring that such things never happen. In any kind of machinery there are certain recognisable factors which contribute to mechanical failure. They might be poor oil lubrication or the incorrect tightening of nuts and bolts. All machines deteriorate quite naturally with time but TPM tries to make sure the deterioration isn’t worse because of poor maintenance. What was interesting was how effective even the simplest of solutions might be. An added bonus is the increased pride that machine operators develop in their own area of the production line as they contribute their own ideas. The results could be seen in a significant reduction in line stoppages. If you are ever worried about the next generation meet Emily MacDonald. 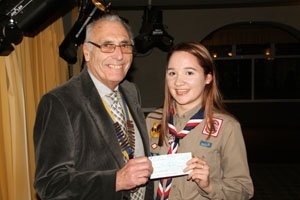 Young, active, intelligent, enthusiastic …… We are sure these were some of the qualities recognised when she was assessed and chosen as one of the representatives of UK Scouts to attend the 24th.World Scout Jamboree in America next July. All together there will be 30,000 Scouts from 130 countries visiting New York and Washington DC. 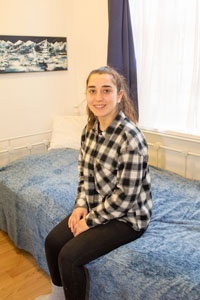 Emily is particularly looking forward to learning more about the different cultures and lifestyles that they represent. She had to raise £3695 to pay for her own expenses and has nearly reached that target. She was chosen to attend communication training in anticipation of media interviews. 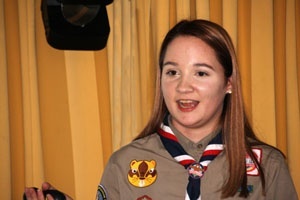 The training obviously worked because she faced a barrage of questions from the Rotary members with charming confidence. President Graham was delighted to present her with a cheque and our very best wishes for a very successful venture. In 2017 The President Elect, Michael discovered that even the simplest of day trips could open up some unexpected tales and discoveries. 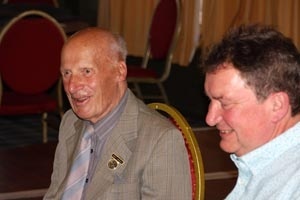 He was part of a group that had been given special access to Allington Castle in Kent. It is not an open access commercial establishment. For the last 20 years it has been the private home of Sir Robert Worcester, an American with a life-long fascination with British politics. Historically the castle was where Henry Vlll met discreetly with Ann Boleyn and where the Wyatt Rebellion against Queen Mary l was hatched. 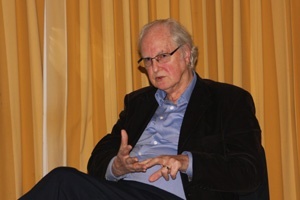 Sir Robert was the founder of MORI opinion polls and has written a number of books, with the title “Explaining …..” analysing what had influenced public opinion prior to recent momentous Parliamentary events. 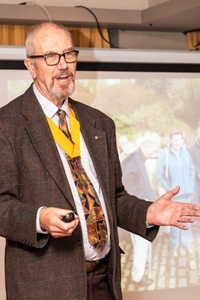 Michael was lucky to meet privately with him and they had a fascinating conversation about how the inhabitants of Allington Castle right up to the present day had involvement and insight into the dramatic changes of British politics. 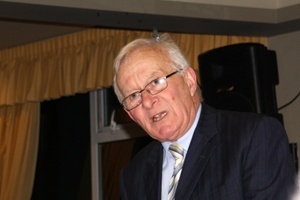 At this time of year we always have a guest speaker who gives the New Year Message. He, or she, is usually speaking from some kind of religious perspective but this time Roger McAddams described his own Humanist approach. We currently live in a time of challenge and confusion about what is truth and what is fake news. The humanist belief was that it was important to seek the best out of our limited lifespan by looking for, and believing in provable truth. Truth is about the reality of the world which can best be found through provable scientific evidence rather than through unprovable ancient doctrines and legends. This is like the legal assessment of evidence to establish as honestly as possible who did what, when, how and why. In the end it is truth that matters. One of the pleasures of Rotary evenings is when a member introduces us to a friend who can share their experience of a different life. Geoff Pratt has lots of friends and his guest was Ian Diggery. 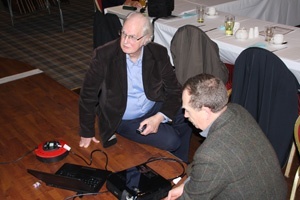 After receiving Geoff’s help in organising the Powerpoint projection Ian told us all about a very varied career as an technical consultant. It ranged from accoustic research to the development of “smart pigs” for the in-line inspection of oil pipelines. You can always judge the interest level of a talk by the number of questions it stimulates and there were plenty tonight. 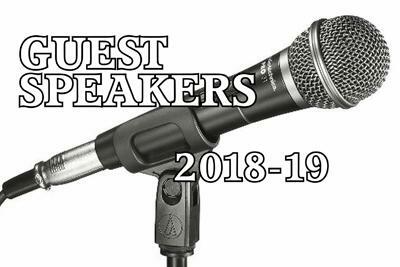 Alan had invited tonight's speaker so when his guest had to cancel at the last minute Alan felt he had to step in. 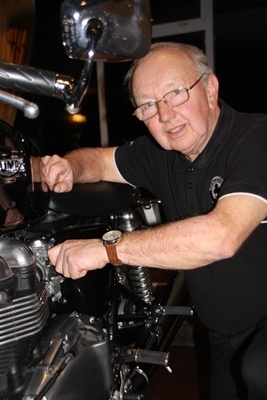 Alan has always been keen on motorbikes, his first was when he was 16 years old. 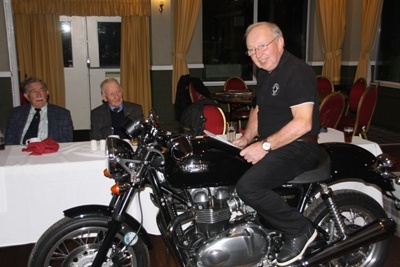 What better way could Alan fill in an empty evening than bring a motorbike. We all found ourselves eating while a beautiful shiny black piece of metal machinery stood in pride of place in front of us. The Triumph retro masterpiece was Alan's latest aquisition. He talked firstly about the historical development of the Triumph Company but became even more enthusiastic when he talked about his own bike. 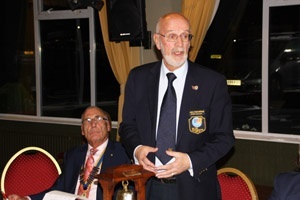 We were delighted to welcome the District Governor, Stewart Atkin during his annual tour of all the Rotary Clubs in the North East. 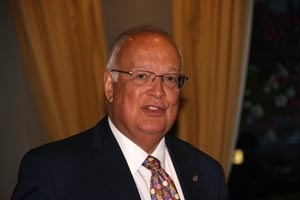 His talk concentrated on the “relevance” of Rotary around the world. We all seek to serve our community, however wide we define that. We all have a role to play. In fact Rotary’s project to eradicate the terrible disease of polio world wide was started by a single Rotarian in the Philippines. 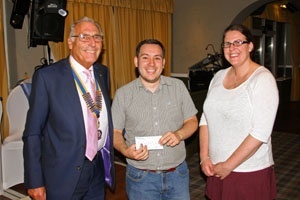 In the case of our club that service might be part funded by selling 1,000 Oxroast Sandwiches and then materialise in supporting schemes like The Wheelchair Trust or Shelterbox. Rotary inspires the next generation through youth training. We support the Disabled Games. We encourage and reward talent. 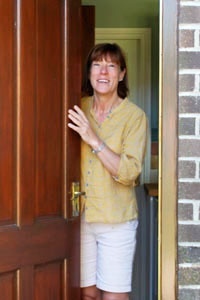 In the UK we provide 16 million hours of volunteer service every year. At the same time we have fun and remain relevant in a world which contains thousands of people who have yet to discover that they are Rotarians. 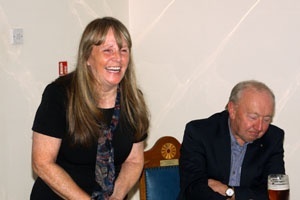 Carol Harrison of the Regional NE Technology Centre gave an inspiring talk to the Rotary Club tonight. She was concerned that more than a thousand school leavers each year in our region has such limited knowledge of opportunities in local industry. Words like “engineering” are only whispered. The system seemed to value only the academic options. Lessons about the essential “soft skills” of team work, initiative, problem solving, and even risk taking are often ignored. She described how next March will see the first Technology Tournament in the Region supported by RTC and Rotary North East. Teams from twenty four schools will face the creative challenge of technological and engineering problems. Our region has historically been at the forefront of great engineering advances. It is hoped that the future may be equally beneficial. 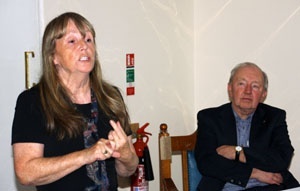 Carol’s talk was serious but it was nice to see she also saw the funny side of life. You can always tell when an after dinner speaker has gone down well. The audience is silent and engrossed until the end when a stream of questions flows. Tonight there were two speakers, Dimas Lopez and Jasmine Burns, from Nightstop North East a charity that takes the very practical step of supporting homeless people to lift themselves from the despair of the gutter and gain the confidence to face a better future. On a single night basis they find volunteers with an empty room willing to provide a room and a meal. The fact of living for a short time in a comfortable and communicative household is sometimes just the boost the young person needs. During the day the charity offers help and advice to find work, and manage the various complexities of living on the breadline. There are currently 55 hosts in the North East and 85% of interventions have led to positive outcomes. The Nightstop option is certainly a pathway to success for many unfortunate youngsters. Ashley took us on a colourful tour of India and shared his photographs. 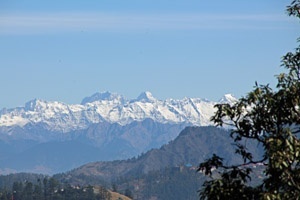 It ranged from the bustling traffic of Delhi to the clear air and peace of the foothills of the Himalayas. 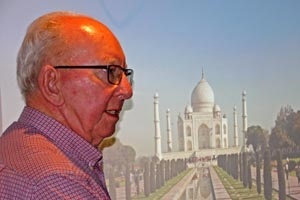 Some of his most memorable “glimpses” were of the iconic architecture. 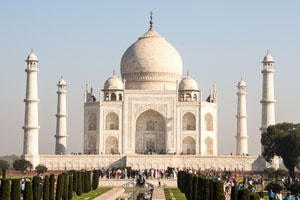 We all recognised the white marble of the Taj Mahal commissioned by The Mughal Emperor, Shah Jahan to house the tomb of his wife Mumtaz Mahal. It was very poignant to be told the sad tale of the Emperor who was eventually imprisoned by his son in the Agra Fort. We shared the view through the window were he could only get a distant glimpse of the tomb of his beloved wife on the horizon. Every time Cliff takes on his role as interviewer in our own version of Desert Island Discs he reveals fascinating stories from his interviewee. This time it was Harry who, having moved to Sunderland, has just started to come to our club. He started his life in Carlisle 95 years ago but soon moved to Keswick. The morning assemblies in his school inspired his first choice of music …”Morning Has Broken”. One happy memory was when at the age of 17 he helped a young girl who had fallen off her bike. She had just been evacuated from Newcastle and eventually became his wife and soulmate for more than 60 years before she sadly died. Memories cover all sorts of emotions and Harry included Bette Midler’s song “Wind Beneath My Wings” as Vera’s favourite song. His wartime in the RAF was illustrated by Glenn Miller. He was a radio operator and spare gunner in a Wellington Bomber operating from an island in the Indian Ocean against Japanese submarines. He then became a parachute instructor jumping from everything from a hangar roof to a balloon or a Dakota plane. After the war he joined the Fire Brigade even though he only just scraped above the minimum height. He soon upgraded his photographic hobby and worked in the Fire Brigade Audio Visual Department. The music continued via Frank Sinatra and Nat King Cole. He soon found himself starting a photographic business in Consett getting commissions to photograph musicians such as the Beatles, Rod Stewart and Tom Jones which led to a different range of songs. Kodak even sent him to Las Vegas. Harry’s was a varied and exciting story and Cliff help him to express it in music. 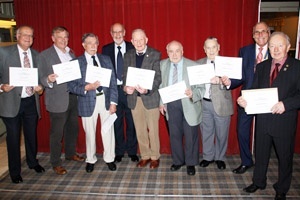 Whenever we get a new member of our Club it is nice to find out a little about them. 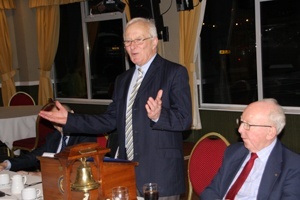 Rotarian Tony moved into the North East and joined us recently. After his talk he was described as “A Jack of All Trades” because the range of his interests, talents and successes was vast. 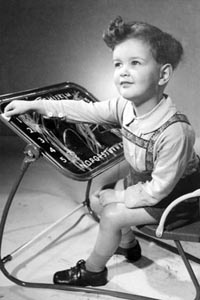 He described his early years in a bomb shattered area of London and his first “job” as a photographic model for Mobo Toys. The more creative side of photography interested him from an early age. He was developing his own photos under the stairs at the age of 10 and he became Chairman of his school’s photographic society. His other main interest had been guitars He bought his first one at the age of 13 and he founded a school skiffle group, played local gigs in a rock band and enjoyed folk music (including Morris dancing). Tony sometimes dreams that music might have been his life but his “jobs” took over. He became involved with computer graphic design and management working for companies such as GEC, Logica, British Rail and British Gas. For ten years he wrote a monthly column for “Computer Systems”. 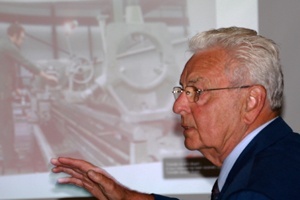 While with Nascom he was involved with the production of the first British computer for under £200. When he retired he returned to his love of photography and set up a successful photographic business. 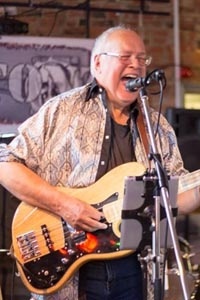 He is still enjoying playing bass in a blues band. What a busy life! We have learnt much from the stories of Ray’s career in the oil industry but tonight he took us back to his early origins as an engineer. 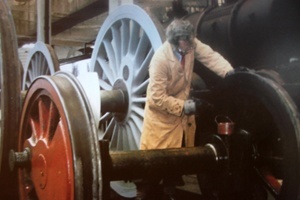 He was working as a lathe turner ensuring that the massive wheels of industry, particularly the ones on steam railway, kept turning. We were a little confused when he talked of regrinding the tyres until we realised that the tyres were actually various grades of metal which covered the hub of the wheel. After years of wear they could lose the essential shape to stay safely on the rails. It was a sobering thought to be reminded that the massive wheels on the Mallard or the Flying Scotsman needed the ongoing skills of craftsmen.